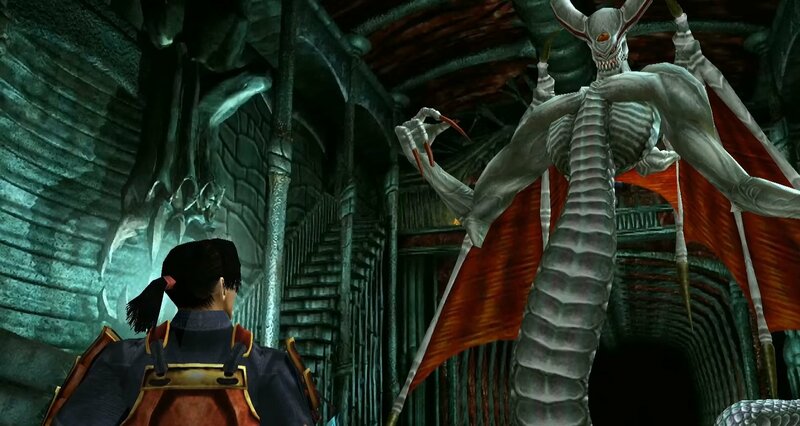 Onimusha: Warlords is finally here, and perhaps the toughest obstacle I faced whilst playing was surviving and defeating the two bosses located in the Demon World – the final area of the game. Everything you’ve done up to this point has been in preparation to finally save Princess Yuki, so hopefully you’ve come prepared. Here are some things to think about before you take the final step towards the Demon World, because once you’re there, there’s no turning back. If you find that you’ve reached the point where you’re ready to unlock the door to the Demon World, don’t go in without making sure your weapons have reached their max level. They only go up to level three, and naturally you’ll be somewhere around this number if you’ve been dilligent when collecting Souls, but if not, go back and harvest more. Enemies respawn everywhere so you’ll no doubt have an option to do so, and if you’re struggling, at the very least make sure both your Raisan Katana (lightening-based weapon) and your Enryuu Sword (fire-based weapon) are maxed. If you haven’t been opening every chest on your travels, go and have another look because you’ll need some herbs and medicine. If you’ve got a couple in your inventory already, well done. You’ll find one whilst fighting the first boss, and two before you run into the final boss, but a few more will give you a better chance of surviving. Hopefully you’ve found some of the Power Jewels and Magic Jewels along the way. They increase the amount of health and magic Souls you can consume. 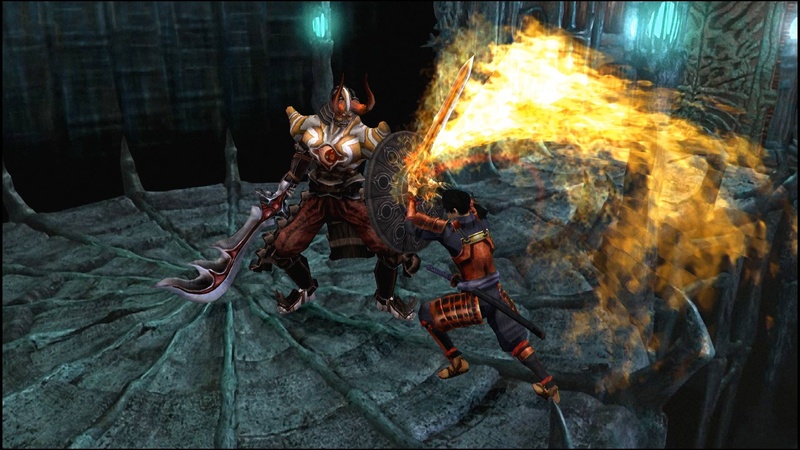 Using plenty of magic attacks will provide you with an edge when fighting Marcellus and Fortinbras, and having as much health as possible is a necessity. Right, all ready to become a hero of the Sengoku Period and rescue the princess? Great. As you step through the huge doors to the Demon World, there’s no exploring. You’re going to be facing Marcellus straight away. Now, if you remember, you’ve already faced this hulking warrior on a rooftop earlier, except this time he’s a lot more powerful. Get ready for a war! There are two stages to defeating Marcellus. Firstly, he has a huge shield and the ability to strike with a glowing red blade. Staying relatively close to Marcellus will stop him from charging at you (which can be deadly), as this attack can’t be blocked. It’s also pointless trying to attack him when he moves towards you holding his shield because he’ll just block your attacks. Try and circle him – block his heavy strikes, then move away and use your Enryuu for a powerful attack, as it is most effective for getting rid of his shield. He’ll also swing his blade as a red glow appears in its wake, so keep your distance and attack from the side. Make sure you collect any Souls he drops so that you’re magic will stay available. If he does manage to knock you off your feet, hit all the buttons repeatedly because he can attack you when you’re down. After he sheds his shield (enter the second stage), Marcellus pulls out two large swords, but this is when he becomes much more vulnerable. Stay as close as you can to him, and block every attack he has. Sometimes he’ll use one big strike, and other times he hits a combo of around four strikes, but as long as you’re blocking you’ll be fine. 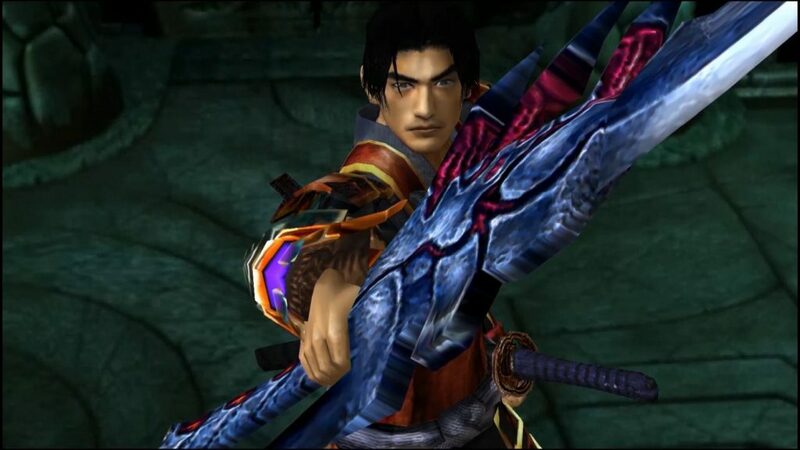 Once he’s stopped attacking, go in for attacks, and harness the power of the Raizan because the electric attack of your Katana can deal huge amounts of damage. As long as you make sure you’re blocking it shouldn’t take long before Marcellus yields, and you emerge victorious. You’ll be pleased to know there’s a Save Point straight after Marcellus, and after attacking a few of those deformed pink sword sponges and one of the stealth demons, there’re two Medicines you can collect. Alternatively, just run past these Genma demons and grab the goods. Fortinbras takes a fair amount of time to defeat, and his attacks are random so you can’t learn a particular pattern, however, you can get used to each one and end up avoiding each attack’s deadliest point of impact. The snake-like demon loves to use fire, and when he starts to breath that fire towards you, make sure you’re not in its path because the first thing it’ll do if you’re in front of it is burn you. When he starts to move his head and the fire drifts from side to side, it won’t get you if you’re at the furthest point back. Another one of his attacks – and perhaps the most annoying – is the pint lightening bolts. Thankfully, a pink marker appears on the ground where they’re about to strike, so you have about a second and a half to get out of their way. The problem is he also likes to fire pink lasers at you, and quite often he does both at the same time. Those pink lasers also get fired independently at times, and he’ll fire a few across the screen, so move from left to right to avoid them. The key to defeating Fortinbras is getting in close and using your sword to hit its tail, but make sure you never outstay your welcome. He has a great reach and often tries to hit you with his big strong arms. You can block so they don’t do any damage, but they’ll still knock you back and cause distance. Also, the more damage you do, the more damage he can do to you. Fortinbras can grab you and pick you up, and when he does you might as well say goodbye because he breathes fire right at you, and you’re health bar will deteriorate rapidly, often ending in death. Going back to damaging his tail, the tell in knowing you’re doing damage comes when he starts to hunch up and eventually fall forward. When this happens, USE YOUR MAGIC! For maximum effect, use your Raizan to inflict plenty of damage on Fortinbras. It will take a while, but as long as you follow these steps when attacking him, you’ll end up saving the princess and escaping the Demon World.